If Racking and Manual Picking is used then trays are often stacked. Our De-Stacking machine is ideal to hold a number of tray stacks on the infeed, and then release them into the system. Our conveyor system will then distribute them to the machines. Our bar code system can be used to route work to specific machines, or we can work with the existing factory bar code system. If an Automated Picking System (supplied by RAX) is used then we offer both an infeed and an outfeed system. Infeed System is for Boxed Lenses and uses a small compact conveyor to feed individually boxed lenses to the loading area of the RAX store. 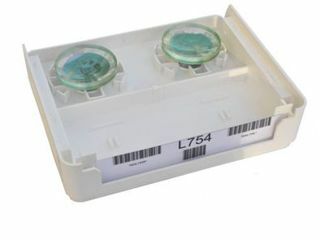 Our system copes with the large variety of box sizes on the market. We can present them to up to five RAX machines at the same time. The RAX store then automatically stores a large quantity of lenses in a very compact space using its robotic picking arm. Around 600 boxed lenses per hour can be automatically fed to the machines. This figure is based on 4 machines and speeds will depend on the size of each machine. 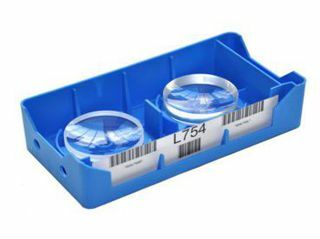 Outfeed System is for Job Trays to be loaded with boxed lenses ready to be processed by the factory. Our system feeds trays up to the machine so boxes can be automatically picked and placed in the tray. Up to five loading points can be operated at the same time. The tray is then moved away from the machine ready for the manual operation of removing the lenses from the boxes. 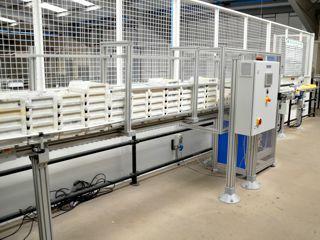 Around 300 trays per hour can be automatically fed to the machines. This figure is based on 4 machines and speeds will depend on the size of each machine.